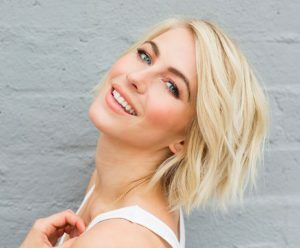 Julianne Hough is an American dancer, actress and country music singer. She is best known for her appearances in the reality dance competition, Dancing with the Stars. She won the reality show competition twice (in season 4 and season 5). In 2015, she won the Primetime Emmy Award for Outstanding Choreography, along with her brother Derek Hough and Tessandra Chavez. She released her self-titled debut album on May 20, 2008, via Mercury Nashville Records, which charted at #3 on the Billboard 200 and debuted at #1 spot on Billboard Top Country Albums. She landed her first main role in the 2011 film remake of Footloose, and starred in the 2013 romance film Safe Haven. Born Julianne Alexandra Hough on July 20, 1988 in Salt Lake City, Utah, in a family of dancers, she is the daughter of Mari Anne and Bruce Robert Hough, and sister to Derek Hough, who is also a veteran and champion on Dancing With the Stars. She also has three older sisters: Sharee, Marabeth, and Katherine. On July 8, 2017, she married NHL center Brooks Laich in Lake Coeur d’Alene, Idaho. She was previously in a relationship with Ryan Seacrest from 2010 to 2014. *She was born on July 20, 1988 in Salt Lake City, Utah. *Her ancestry includes English, German, Swiss-German, Dutch, French-Canadian, Scots-Irish, Scottish, Danish, Swedish, and French. *All of her grandparents were professional dancers. *She won the Junior World Latin Championship of dancing at age 15. *She is a two-time professional champion of ABC’s ‘Dancing with the Stars’. *She officially became a judge for Dancing with the Stars in September 2014. *In 2008, Maxim Magazine ranked her #30 on its Hot 100 Women list. *She launched her lifestyle website and blog, Jules in 2015. *She was once engaged to Zack Wilson (2006). *Follow her on Twitter, YouTube, Pinterest, Facebook and Instagram.